It was yet another early rise for our next journey from Mandalay to Bagan. We decided to do this by river boat that is mainly for tourists due to the cost and duration of trip at around 10 hours, compared to the slower local’s boat which takes around 2 days! We could have taken a bus at around 6 hours, but the appeal of cruising all day down the Irrawaddy River sounded a good way to go, and it turned out a good decision. 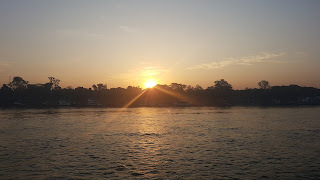 So, an early morning taxi from the hotel to the jetty for a 7am departure got us there a bit early thankfully, as it turned out to be a busy boat and with limited space on the shaded upstairs deck, we did manage to get a couple of seats in that area. 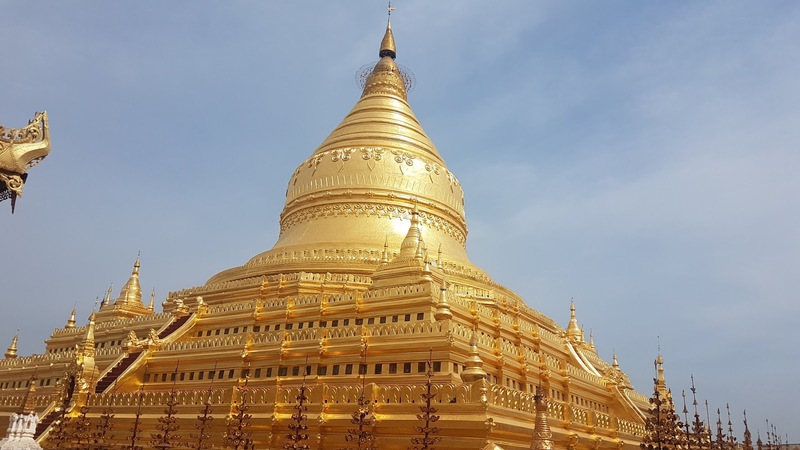 It was a decent river cruise boat and with better toilets and food than expected, it made it a nice relaxing way to enjoy the day, with stunning views over the river banks at all the local villages, fishermen at work and of course the sun shining on the golden pagoda stupas. Breakfast was served not long after departure, then we got lunch plus an afternoon snack, and after a few beers we arrived at Nyaung-U jetty around 4pm. 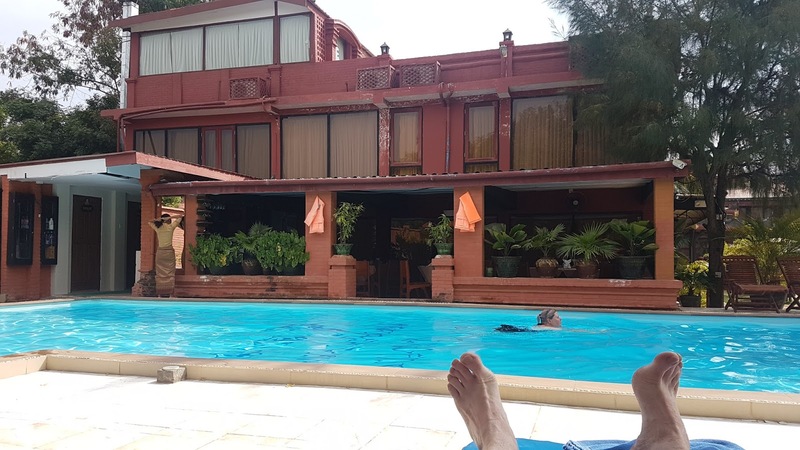 Our hotel was in New Bagan, around 12km from the jetty and away from the hugely expensive resorts of Old Bagan. The local taxis waiting wanted a bit more than we expected, but thankfully we found a French family to share the journey with us. Arrival and check in at the hotel was fine, and our room was what we were expecting but it was also slightly over our usual budget. But the hotel also had a gorgeous pool which we made use of in the heat of the afternoon sun every day. We walked to a TripAdvisor recommended vegetarian restaurant on the first evening, and we weren't disappointed as it was delicious. The food we had the other 3 nights was just as good, although breakfast at the hotel wasn't the best we had on this trip. Highlight for Sadie was a Rakhine Fish Curry which was lovely. Getting around the Bagan conservation area, which you must pay £12 each on entry to do so, was best done by some mode of transport. 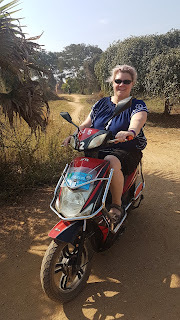 The area is around 10km square and the best way to do this for tourists is using an e-Bike, very similar to a moped but powered by batteries as we can't use our normal UK driving licence or International Driving Permit in Myanmar. We didn't use the ones from the hotel as they were more expensive, however we did have a place pretty much right next door, and on the first night we agreed a price of 18000k (£9) for 2 bikes for 2 days with an older male, however when we went to collect them the next morning, a young lad about 10-12 years old accepted 16000k, though we aren't sure if he would have just taken anything. He didn't speak much at all, and the couple of times we went back to change the bikes or ask anything, he just agreed or scooted off on one of the bikes to what we assume was where they lived and spoke to an adult. We also got our washing done here, though the young lad did go off and fetch a woman who accepted a rough guess of 5kg, though it was more than that I'd say. 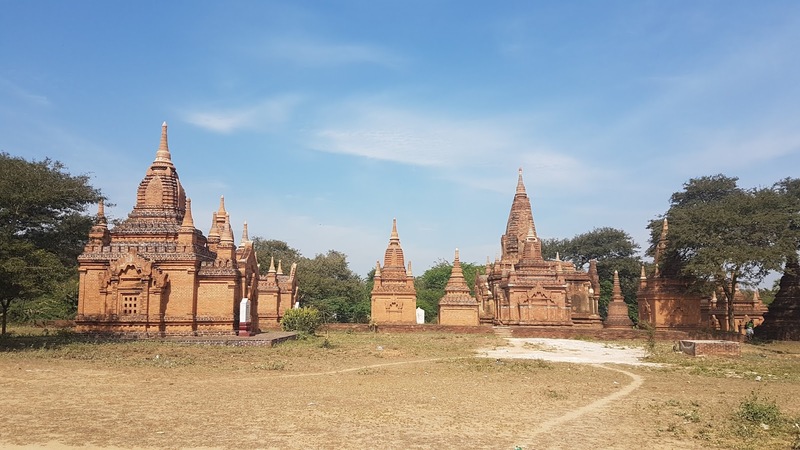 There were around 4000 Temples, Pagodas and places of worship built between the 9th - 13th Centuries, of which just over 2000 remain with many destroyed by a huge earthquake in 2016. 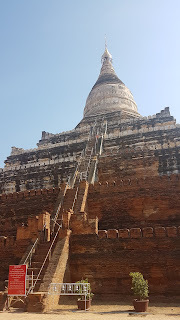 The remaining ones are spread across the vast plains and inside the city walls of Old Bagan and are literally everywhere you look. Small ones, ruined ones, giant ones, golden and white ones, they are truly a sight to behold and words really can't describe how amazing they all look, even the photos we took do not do them justice. 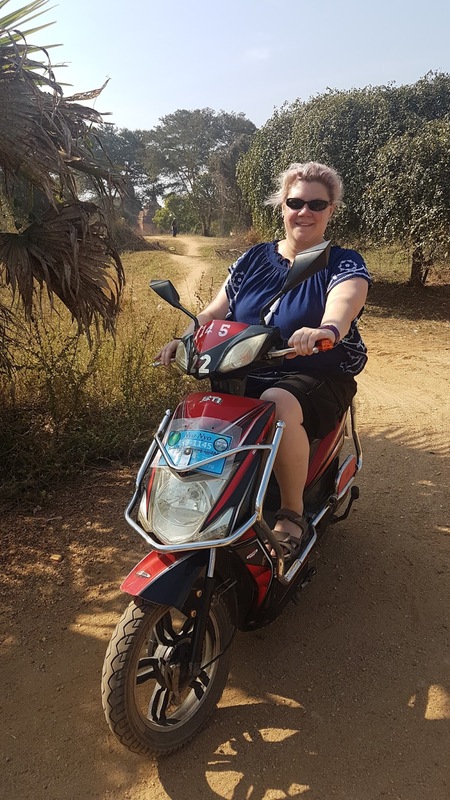 We spent pretty much 3 full days going around the area in the mornings and late afternoons, working of a map of the area from the hotel plus Google Maps, which also helped us find some out of the way ones down sandy tracks, which are not easy to negotiate on a small wheeled e-Bike! And on the last afternoon, Sadie even managed to take us down a dried-up stream and through a rubbish dump! Sadly, over the past year or so, most of the larger structures are no longer able to be climbed due to new conservation procedures and some are also still undergoing restoration due to people climbing up them over the years and earthquake damage. Most of them have had metal gates fitted to the internal stairwells and they are also in the process of fencing off the external steps to other ones, so it seems the days of hordes of tourists scrambling up them are over, but at least it's for the best to preserve them. We didn't manage to find any decent sunsets the first couple of days we spent in the area, however we did go out on the last morning for sunrise which despite the early alarm clock, turned out to be worthwhile as we watched the sun come up over the mist and shine its beautiful orange glow over the surrounding temples. Some people pay more than £200 to go up in a hot air balloon for sunrise/sunset, whilst it looked amazing sadly it was out of our budget, but they did look good on the horizon too. 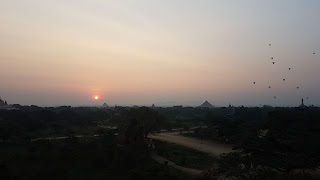 We also went out for sunset that day which was the best out of the 3 days, and we watched this from one of the raised viewing mounds that the local authorities are now building to allow the tourists to watch these amazing views. One thing I must mention is the friendliness of all the people here and across Myanmar in general. Everyone greets you with 'Mingalaba' which is Burmese for Hello, and they are happy to help and chat if needed, even the sellers at the temples who all want you to buy something, sadly on explaining that we have no room for anything, they do accept that and still chat away. It's been a fun and relaxing 3 days in this area, however it's time to move on again and we have an early morning domestic flight to Heho to catch, which is the nearest airport from the wonderful Inle Lake which we are both looking forward to exploring.